Improve Pressure Ulcer Specificity . 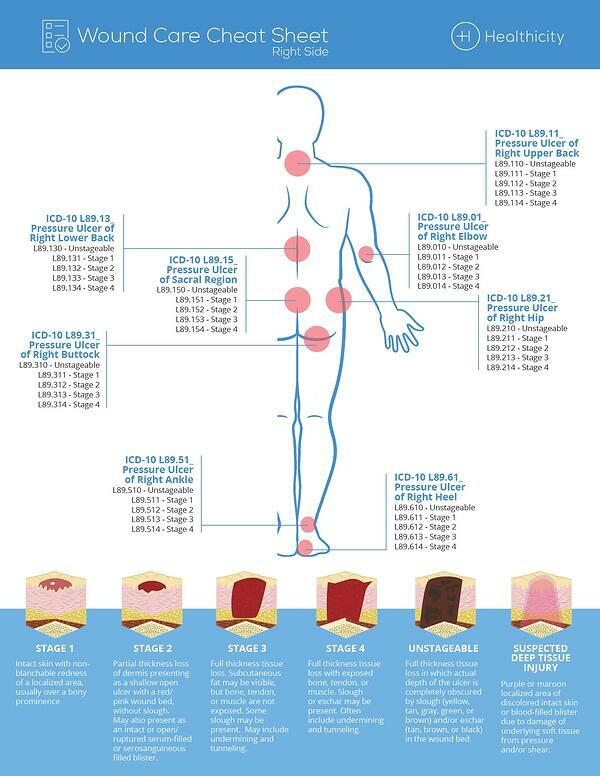 Pressure Ulcers are injuries to the skin and underlying tissue. You may often see them referred to in the patient’s medical record as “bed sores” or “pressure wounds” or “decubitus ulcers.” These pressure injuries can range from mild in nature with redness to the skin to very severe with tissue damage and infection that extends deep into the muscle and bone. Pressure ulcers are often challenging to code because the documentation doesn’t always include the stage or the descriptive words we need to make the most appropriate ICD-10-CM code selection. In ICD-9-CM specificity was also an issue, but now with ICD-10-CM coders can more accurately capture the ulcer location and severity. For example, in ICD-10, there are 15 unique codes for left, right, or unspecified heel combination with the depth of injury to the skin, fat layer, muscle or bone.